The fate of the former Cumberland Presbyterian Church came up at a city council work session Monday. The outcome was inconclusive. Three members of the Albany City Council say they don’t want tax money spent on moving the former Cumberland Presbyterian Church and restoring it as a community center. That leaves the fate of this project up in the air or, more to the point, up to potential donors. A work group assembled by Mayor Sharon Konopa has been discussing a move of the city-owned building. The group wants to move it two-tenths of a mile from Santiam Road and Main Street to a vacant city-owned parcel at Santiam Road and Pine Street. The chore of working out details fell to Ed Hodney, director of parks and recreation. On Monday Hodney showed the council drawings by architect Bill Ryals, a member of the work group who had volunteered to illustrate how the old church might fit on the site. Hodney also said he’s been talking with two builders willing to help with the foundation. The idea is that the city would pay to have the building moved and secured on a foundation, which might run about $200,000. Then the city would seek private donations and grants to finish the conversion to a community center and related facilities, the final cost of which has not been discussed. There ensued a lively discussion, during which Councilors Bill Coburn, Rich Kellum and Mike Sykes spoke against using tax money for the project. Sykes had expressed himself along the same lines all along as a member of the mayor’s work group. The mayor argued for city support of the move, probably with money from CARA, the downtown urban renewal district. Once the building is moved and people can see what it might be, she expects people will be ready to contribute to complete the project. How, she wondered, can Albany “continue to be a vibrant community” if the council is not willing to back projects like this. CARA funding would have to be approved by the Albany Revitalization Agency, which is the city council. If the three stick with their position of no tax money and there’s a 3-3 tie, the mayor could break it. So it would come down to how Councilwoman Bessie Johnson, who was absent Monday, votes when the funding issue comes up. Buy the Venetian Theater back. Move the Cumberland Church to a suitable location for the Mennonites to resume church services. Use the Venetian for a music venue as well as comedy, while during the daytime, use it for classic movies. The Venetian would draw young and old alike. Frankly, it is an Albany treasure. I love this idea. I have a lot of the same concepts in mind for the Venetian. I think the city can better utilize the money. I have an idea, repair the streets. Let’s hear it for the City Council (for once). Failing their suggestion, perhaps the Albany Fire Department needs a structure to practice on. If it is to be a “community center”, there should be “community dollars” behind it. A.K.A. Tax Dollars. Or maybe the solution is similar to the problem in search of an answer at OSU. Other’s mentioned it in a previous posting. Naming Rights! It can be the “Coburn/Kellum/Sykes, LLC Steeplechase Community Center”. Might need to through a Johnson into the mix too. Now just wait a cotton-picking moment! Didn’t that same City Council spend a bunch of $$$ on that CARA-sel deal??!! 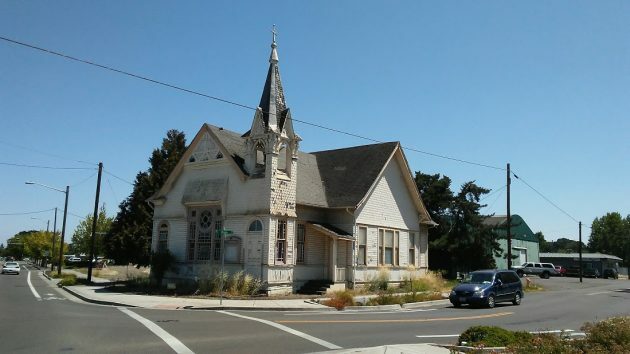 If that derelict church was at say 4th & Ferry that City Council would be falling over themselves to fund it. Guess the building is just too far outside of their cherished “downtown”. They act like a cheap pimp! It seems odd that our City Mothers and Fathers would conflate moving of an ancient church serves as an indicator of a”vibrant community.” Vibrancy might better be displayed if the City were to tear the chu ch down and sell the property for a profit. How is killing your own city’s soul “vibrancy”. This church is a historic treasure! Vibrancy and greed should not be confused. Betty Fennell commented via email: I love this church! It’s beautiful. I drive by it everyday on my way home. I’d love to see it moved and put to good use. Why let it set there and rot away. I don’t feel we the tax payers can really afford the cost of moving it. If there’s a program that can find it and we have volunteers to help get it back up and functional again I say let’s do it! I’m sure a lot of us in the community would be willing to help get this beautiful church back on its feet and make good use of it. There is an old church in Sisters that provides a great venue for live music throughout the year. Maybe this old church could do the same! I’m thinking of some land the city owns across the tracks from the Calapooia Brew Pub that might make a great spot? Probably has enough room for parking as well.